Why not try one of our money saving "Package Deals"
At the time of cleaning all ovens are stripped back to reveal internal fans to allow for cleaning. All doors where applicable are removed and glass cleaned on all sides. Oven Bliss guarantees a first class clean every time. If your requirement isn't listed contact us and we will see how we can help. Our expert Swindon oven cleaning service will leave your appliance sparkling and looking new! Who doesn’t love a delicious home-cooked meal? But when it comes to cleaning up afterwards, members of your household may well be a great deal less enthusiastic. One look at the splatters and spills and they disappear quicker than the food did! In the rush to get on with our busy lives, most people find themselves doing only what is necessary to clear up after a meal. Hands up if you live in the Swindon area, and you wash up thinking “I will clean the oven next time”. Especially harassed parents or young people with far better things to do with their time... You need our Oven Cleaning Swindon service. Help, my oven is filthy! You would certainly not be the first one to look at your cooker one day and realise that the accumulation of splashes, sprays and fumes has created a grimy, greasy film. Or maybe clinging carbon means it's black as the night in that oven. Sometimes you only realise there's a problem when there is a smell of burning and other odours every time we cook. Fear not. 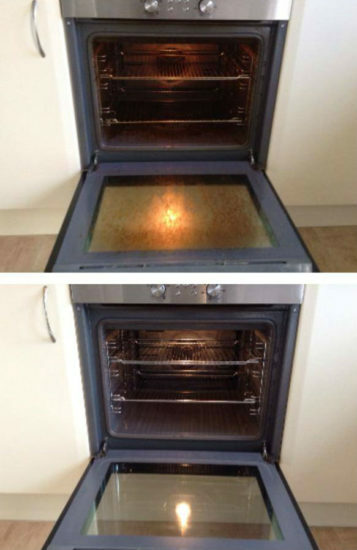 This is a problem you share with many other homes in Swindon, and it's something that can be sorted quickly and discretely thanks to Oven Bliss. How does oven cleaning in Swindon work? Oven Bliss uses the best possible products for oven cleaning but also has the expertise to get the best possible results. We can have your oven hygienically clean and visually brilliant in no time. If you want the complete package, we also offer hob and microwave cleaning. We can come weekly, monthly – or as a one off. It depends on how much you use your cooker. Even if you do have the time to cut through the grime yourself - or you get into the habit of regularly cleaning your oven - having a professional “once over” regularly is a great idea. Expert cleaning can ensure your cooker and oven stay working efficiently for much longer. Oven Bliss also provides specialist commercial oven cleaning in Swindon. We are happy to use our experience and in-depth knowledge to tackle even the most challenging oven clean-ups. Moving house in or out of Swindon? Oven Bliss would be happy to ensure that the cooking equipment in your new home is spotless. Or, help you to make sure you don't leave an embarrassing health hazard behind for new residents of your property. Oven Bliss is 100% reliable and fully insured, meaning any oven cleaning services in Swindon are carried out with the utmost care and precision. We know the best products to use to get perfect results, and the right tools and methods to get into the corners and mechanisms of ovens. The Swindon Oven Bliss team also offer something else that local homeowners and commercial kitchens can rely on – good old-fashioned elbow grease! We protect floor surfaces carefully as we carry out oven cleaning in Swindon. And we make sure there is no damage to surfaces or items around your oven either. Oven Bliss cleans your oven with minimum disruption. The only way you will know we have been is when the oven in your home looks like new! And when you next cook using equipment you can be proud of. Contact us today and our friendly team will impress you with our oven cleaning Swindon service.